For over 20 years, FOCA has provided risk management and insurance programming support for Ontario’s waterfront community associations. The FOCA Insurance Program is our largest and most significant association membership benefit. Read onward for general information about Risk Management and FOCA’s work to protect our members. Since July 2012, FOCA has been pleased to partner with Cade Associates Insurance Brokers Ltd. for our members’ insurance needs. You can talk to Cade’s professional staff about any of your insurance questions and remember to tell them you’re a FOCA member! A seat on the board of directors or active participation in an association’s activities can be both challenging and enjoyable. It does, however, carry more personal accountability than many volunteers realize. Due diligence and proper safeguards can help to minimize the risks inherent with serving as a director or volunteer with a cottage association. In March of 2008, FOCA enlisted the support of the Imagine Canada Insurance & Liability Resource Centre for Non Profits , covering “Enlightened Risk Taking”, and to review the basics of insurance coverage that every association should understand and consider. 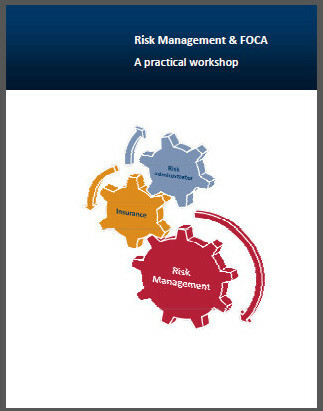 The underlying tenet of the workshop, and of the accompanying Risk Management Manual, was to inform our volunteer associations about lowering the risks involved in their activities, mitigating the damages from potential financial or other losses. FOCA’s aim is to help “Protect our people” – volunteers are the lifeblood of our membership. The FOCA Cottage Association Risk Management Manual was originally produced in 2005 to assist local associations to identify and manage risks associated with their activities. It was updated in 2008. 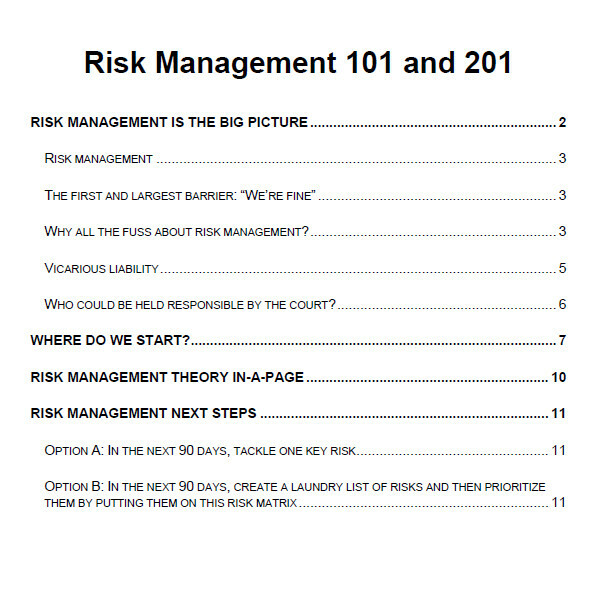 The FOCA Risk Management Manual (244 pages) was developed for FOCA by Imagine Canada’s Insurance & Liability Resource Centre for Non Profits. 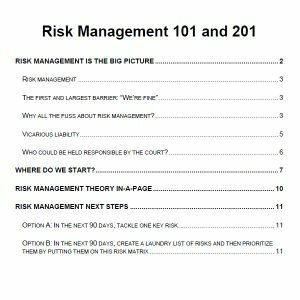 FOCA Members may download a free copy of the FOCA Risk Management manual, a valuable tool for assessing your association’s liability concerns. A FOCA benefit: Cottage First!